Heat oven to 350°F and spray a baking dish with cooking spray. Press the cookes into the bottom of the pan making a solid layer on the bottom. Cook for 17 minutes and cool COMPLETELY (1 hour in the fridge usually works). In large bowl, beat cream cheese and 1/4 cup splenda with electric mixer on medium speed until smooth. Fold in whipped topping and Reese's candies. Spread over cooled cookie base. In small microwavable bowl, beat peanut butter, milk and 2 tablespoons sugar with wire whisk until smooth. Microwave uncovered on High 30 to 60 seconds, stirring after 30 seconds, to thin for drizzling. Drizzle mixture over filling. Sprinkle with Reese's. Refrigerate until solid. Cut into 15 bars. Preheat a griddle to 350. In a large bowl, combine minced onions with avocado, tomatoes, cumin, salt, and pepper. Stir until a chunky guacamole forms. 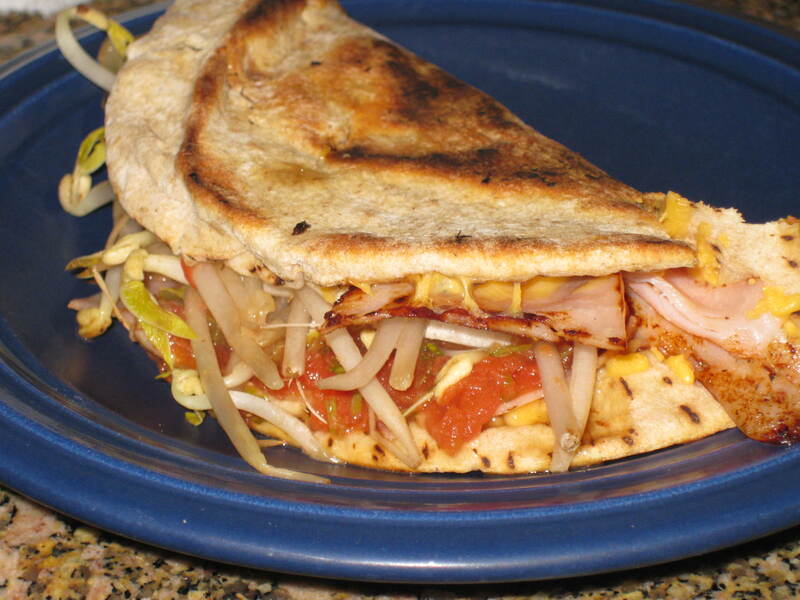 Lay tortillas flat. Spread 1/3 cup of the avocado mixture, 1 teaspoon green chilies, 2 tablespoons crabmeat, and 1 tablespoon cheese on each. 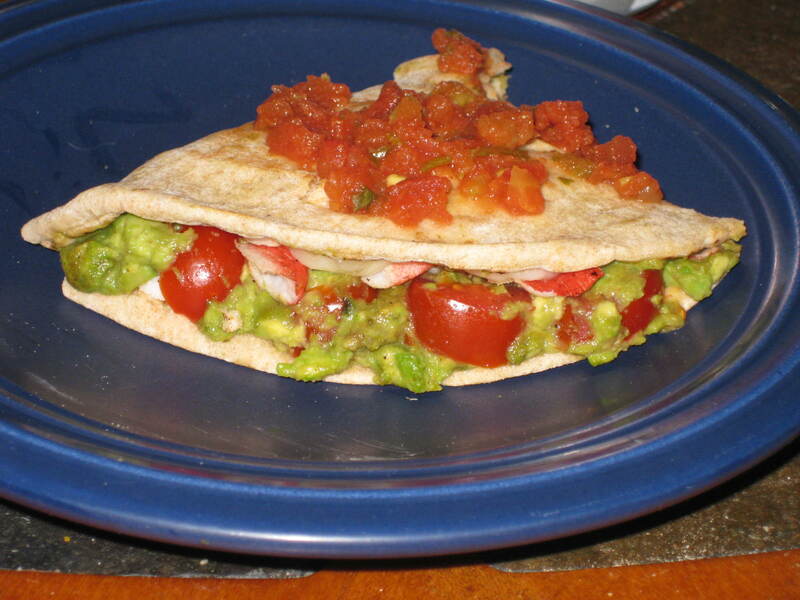 Fold tortillas in half; place on griddle. Cook 3 to 5 minutes per side, or until cheese is melted. Serve with salsa and sour cream. 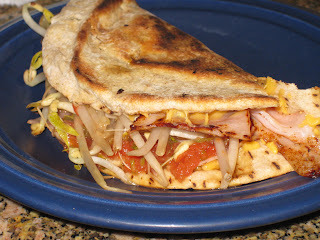 Assemble all ingredients on the pita and fold in half like a quesadilla. Cook about a minute on both sides in the skillet just to melt cheese and crisp the outside. Now, I know making a pizza is as easy as buying a refrigerated or premade pizza dough, pizza sauce, and assembling toppings...but that usually runs you a lot of calories you don't need. I make my pizzas from scratch, making them healthier, lower calorie, and of course, tastier! Feel free to change up the toppings however you like! My homemade/healthy pizza sauce (you'll only use 1/3 of this. The left over makes good spaghetti sauce, or save for another pizza, chicken parmesan...whatever). Place the sauce ingredients in a blender and puree. Spread 1/3 of the sauce on the dough. Refrigerate the rest of the sauce. Arrange the toppings on the pizza. Mist with cooking spray. Bake for 13 to 18 minutes, or until cheese is bubbly. Cut into 6 slices. One of my favs. I've used chopped carrots to make a carrot cake before, and I've used mashed bananas. Use whatever fruit you want! I'm sure chocolate chips would work too! Mix all ingredients except blueberries in a bowl with a mixer until blended, scraping the sides as needed. Stir in blueberries, and pour into a 8x12 baking dish coated in cooking spray. Bake 35 minutes or until a toothpick inserted in the middle comes out clean. Cool COMPLETELY. You may even want to refrigerate it for a bit. If it's not completely cooled before you glaze it, the warm cake will melt/absorb the glaze. Mix the water and powdered sugar. Use a spoon or a basting brush to glaze the cake. Place under a fan or directly in the refrigerator to solidify glaze. Store in the fridge.